The neighborhood of Fort Trumbull was demolished as part of plan for the economic development of New London. The plan was appealed in a case that reached the US Supreme Court, Kelo v. City of New London.However the site IS being redeveloped under a Municipal Development Plan or MDP. The Fort Trumbull Municipal Development Plan (MDP), approved in 2000, is one of the largest redevelopment projects in the history of the City of New London. The MDP area encompasses approximately 35 acres of development project sites that range from one to seven acres in size, within a total project area of more than 80 acres. The Fort Trumbull District / MDP area is approximately one mile from New London’s Historic Downtown Waterfront District. In 1775 Governor Jonathan Trumbull recommended the building of a fortification at the port of New London to protect the seat of the government of Connecticut. 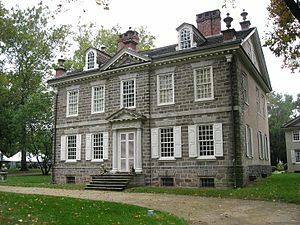 Built on a rocky point of land near the mouth of the Thames River on Long Island Sound, the fort was completed in 1777 and named for Governor Trumbull, who served from 1769 to 1784. In 1781 during the American Revolutionary War, the fort was attacked and captured by British forces under the command of Benedict Arnold. – Extract of a letter from New London, dated Sept. 12. Arnold had long promised to visit New London and the neighbouring towns on the sea shore, and the enemy having frequently appeared in sight of the harbour, the alarm guns fired on the present occasion were considered by the country around us the salutes of prizes or other vessels belonging to the port. He however arrived the 6th inst. about five o, and at seven o’ landed about 2500 men, half on each side of the river. At 8 o’ the militia mustered in parties of 8 or 10, and annoyed the enemy until about 100 of them came up and disputed their way to Fort Trumbull; their great superiority obliged our people to yield to them the possession of the fort. Col. Ledyard, with about 76 other brave fellows, retreated to the fort on Groton side, which they determined resolutely to defend. The next assault was upon this fort, where they were repulsed several times by a bravery unequalled, for about three hours. A flag was then sent, demanding a surrender of the fort, accompanies by a threat of giving no quarters in case of refusal. The commandant consulted with his brave garrison, who refused to submit. The action was then renewed, when the flag staff was unfortunately shot away; notwithstanding which the defence was gallantly continued until about five or six hundred of the enemy having forced the pickets had entered through the breach. At this time there were but four of the garrison killed, and it was thought prudent to submit, to preserve the lives of the remainder. The officer who at this time commanded the assailants, (Major Montgomery being killed) enquired who commanded the garrison? Colonel Ledyard informed him that he had had that honour, but was unfortunate in being obliged to surrender it, at the same time delivered up to him his sword, and asked for quarter for himself and people; to which the infamous villain replied, , ye rascals, I give you quarters,” and then plunged the sword into his body. The inhuman banditti, taking this as a signal, drove their bayonets up to the muzzles of their pieces into the breasts of all that were taken, except one or two who made their escape. 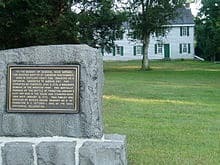 After massacring the living they insulted the dead, by actions too horrid to mention — the bodies were arranged alongside of each other for the purpose, and, to shew contempt to Col. Ledyard, they singled out a Negroe to place next to him. Never was there more distress in any place than there is here at present; there are 50 widows within 8 miles of Groton fort. In the early 19th century, the fort was redesigned and rebuilt to meet changing military needs. 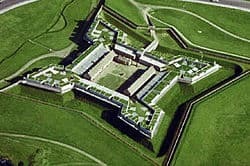 First a redoubt was built at the site to react to threat of British attack.The present fortification was built between 1839 and 1852 as a five-sided, four-bastion coastal defense fort. The new fort was built under the supervision of Army engineer George Washington Cullum who later served as superintendent of the United States Military Academy at West Point, New York. During the Civil War, Fort Trumbull served as an organizational center for Union troops and headquarters for the U.S. 14th Infantry Regiment. Here, troops were recruited and trained before being sent to war. Fort Trumbull was briefly commanded by John F. Reynolds who rose to rank of major general and was killed at the Battle of Gettysburg in 1863. After the Civil War Fort Trumbull was improved by having more modern artillery pieces installed. In the early 1900s several more modern Endicott era fortifications were built to defend Long Island Sound. Fort Trumbull served as the headquarters of these forts until it was given to the Revenue Cutter Service (later renamed the Coast Guard) in 1910 for use as the Revenue Cutter Academy which was renamed the United States Coast Guard Academy in 1915. The Coast Guard Academy moved to its current location in New London in 1932. Fort Trumbull served as the Merchant Marine Officers Training School from 1939–1946 and trained most of the Merchant Marine officers who served during the Second World War. One of the Merchant Marine officers trained at Fort Trumbull was actor Jack Lord who is best known for playing Steve McGarrett on the popular TV series Hawaii Five-O in the 1960s and 70s. After the war, Fort Trumbull was the site of a satellite campus of the University of Connecticut from 1946 to 1950 educating war veterans attending college under the GI Bill. From 1950 to 1990 Fort Trumbull was the location for the Naval Underwater Sound Laboratory which developed sonar and related systems for US Navy submarines. In 1990 the Sound Laboratory was merged with the Naval Underwater Systems Center in Newport, Rhode Island. After a redevelopment period lasting several years Fort Trumbull was finally opened as a state park in the year 2000. Today, the fort serves as a state park and tourist attraction.